They used to belong to my father, who wore them until the eighties I think, and passed them on to me when I was a teenager in the mid-nineties. The aspiring hippie/grunge that I was at the time wore them to death (they got ripped in a few places and almost all of the buttons came off), then I grew tired of them and put them aside, but I could never resolve myself to throwing them in the trash. And boy I’m glad I didn’t! They pair so well together as a Datura blouse and there was just enough fabric to cut around the major flaws. 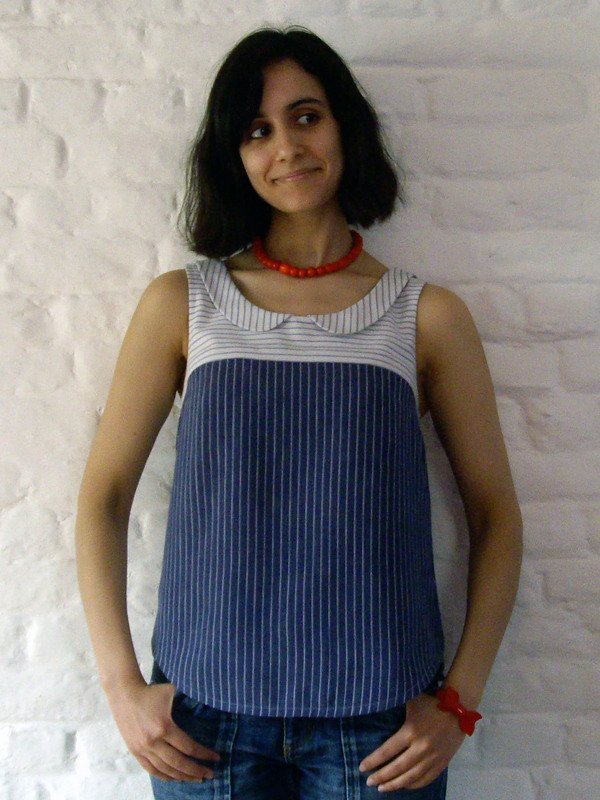 I decided to cut the yoke with the stripes going horizontally because the stripes actually aren’t the same width on the two shirts, so it would have been impossible to match them. And I must say I quite like the result with the different stripe directions. But did you notice the mistake I made (no, not the bra peeking out!)? The two parts of the collar don’t meet! I think I messed up when I tried to trace a slightly smaller undercollar for the seam to roll under more easily, oh well! The result doesn’t really bother me I must say, let’s call that a design feature! 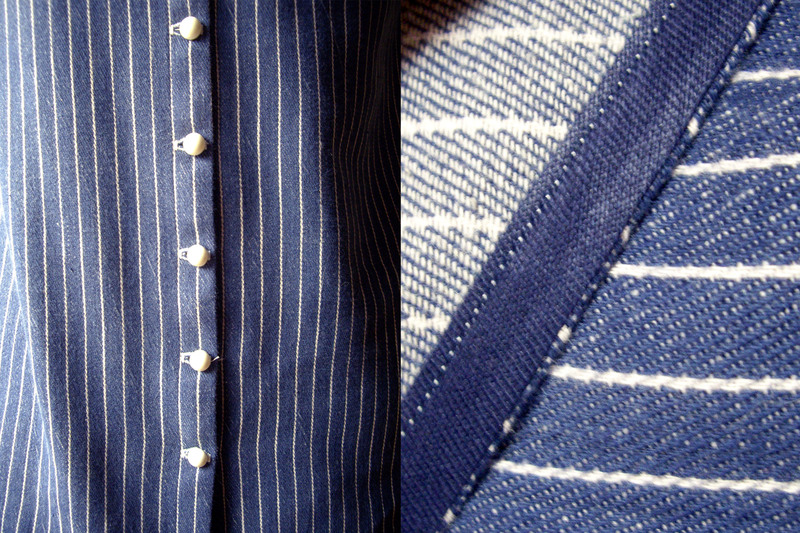 A deliberate change I made is that I put on five buttons instead of three: I wanted to use those cute little vintage round buttons I had in my stash (I hesitated between those and red ones, but I thought the white ones would make the blouse easier to match), and since they were smaller than the ones recommended, it looked better with five of them. 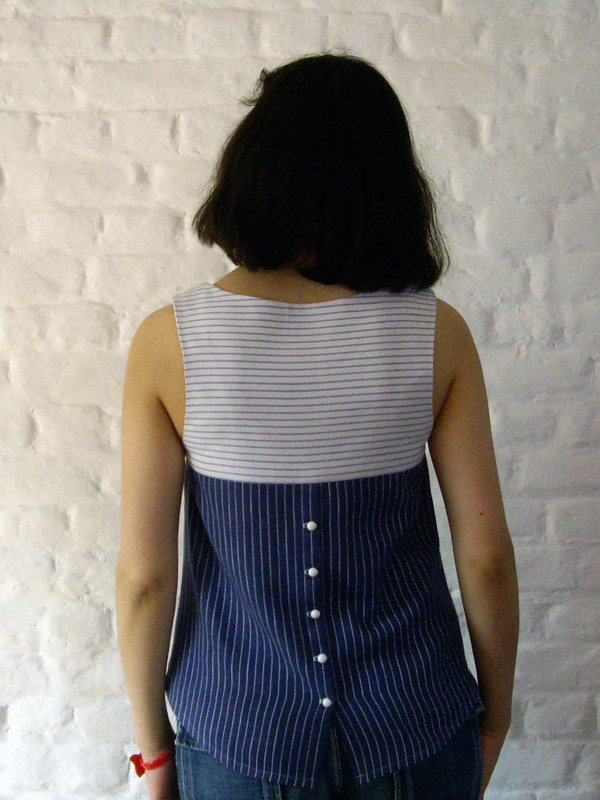 Plus I wanted to be like really really sure that my behind be covered at all times, so I sewed the last button lower than indicated on the pattern. Other than that I followed the pattern to the letter. The directions were very clear, with helpful drawings whenever needed, though I had a hard time understanding how to sew the inside and outside yokes together, but I managed it in the end! Oh yes, one last thing I forgot to mention is that I didn’t have enough fabric left to cut my own bias tape, so I used a very narrow vintage one I had in my stash. Come to think of it, I didn’t have to buy a single notion to sew the blouse! Anyway, with this bias tape, the way the yoke is constructed and the French seams I used on the sides seams, I can truly say that the inside looks just as nice as the outside. So, despite its flaws, I’m very happy with my blouse (though after such a long winter it felt so weird being sleeveless while taking the pictures). It won’t be my last Datura and it certainly won’t be the last Deer&Doe pattern I sew! This is a very pretty Datura. I love the way you used the stripes! The shirt looks flawless. I didn’t even notice you’d made a mistake until you said so. You could consider putting a button there if it really bugs you, then it would be reminiscent of a banksia blouse. Great work! I thought about putting a button there, or even a fake button placket (and I thought it would be reminiscent of a Banksia indeed), but it actually doesn’t really bug me, so I’ll just leave it that way. This Datura is great on you. 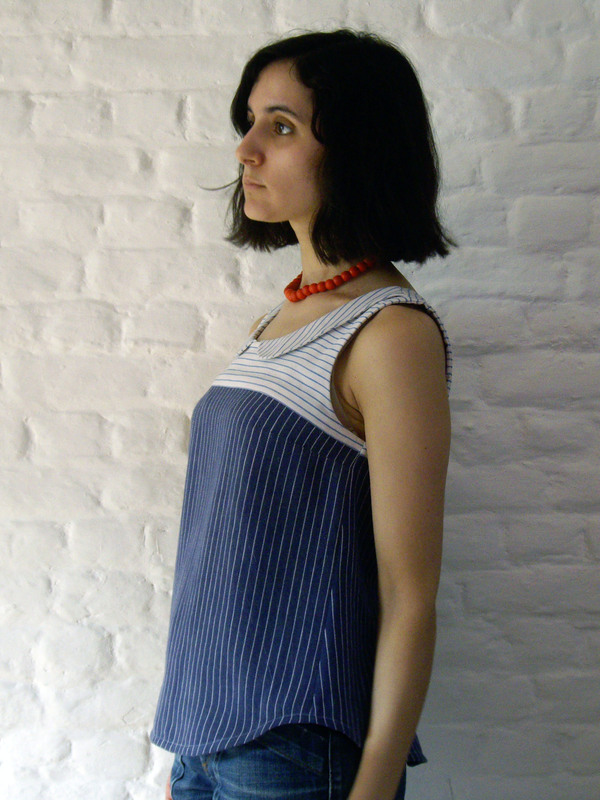 The differents ways that you gave for the stripes is a good idea. And it’s just an honor for these two shirts of your father!!! A very good lesson of reclyclage. Woaw, j’m’impressionne, j’vais devenir bilingue!! Your blouse looks beautiful and is a very special item too! Made out of your father’s old shirts, you should be really proud ;-)! J’aime beaucoup le col ainsi : ça change un peu du col Claudine, avec sa symétrie parfaite on dirait vraiment que c’est fait exprès ! L’avant-après est assez impressionnant :). Franchement c’est une réussite ! Those shirts have had quite the full life! It’s great that you managed to use them to make such a great shirt. Construction looks lovely and it looks really good on you! 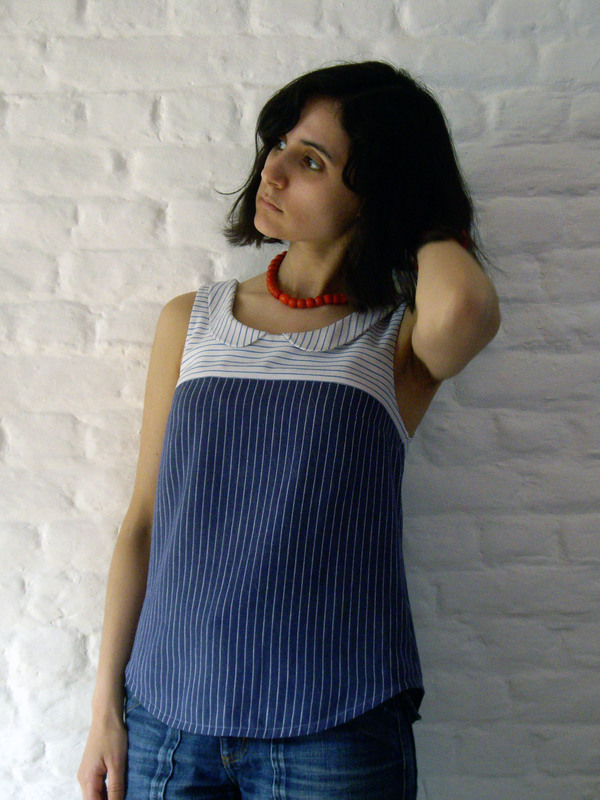 This blouse is great, when I found out they were up-cycled from two shirts… even greater. Your top is awesome! Great work and the fit is really nice! 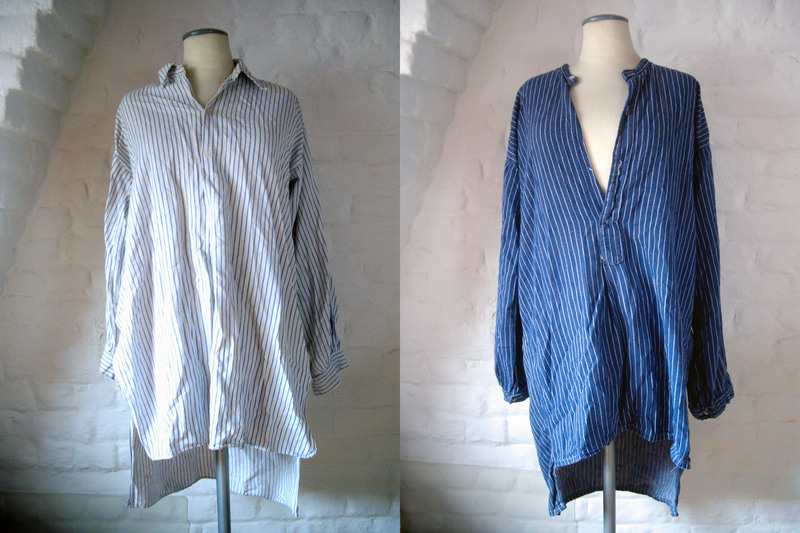 What an ingenious way to refashion your dad’s shirts. Super cute! Wouaouh ! elle est superbe cette transformation des chemises de papa !!! Found your blog through Flickr MMM2013. 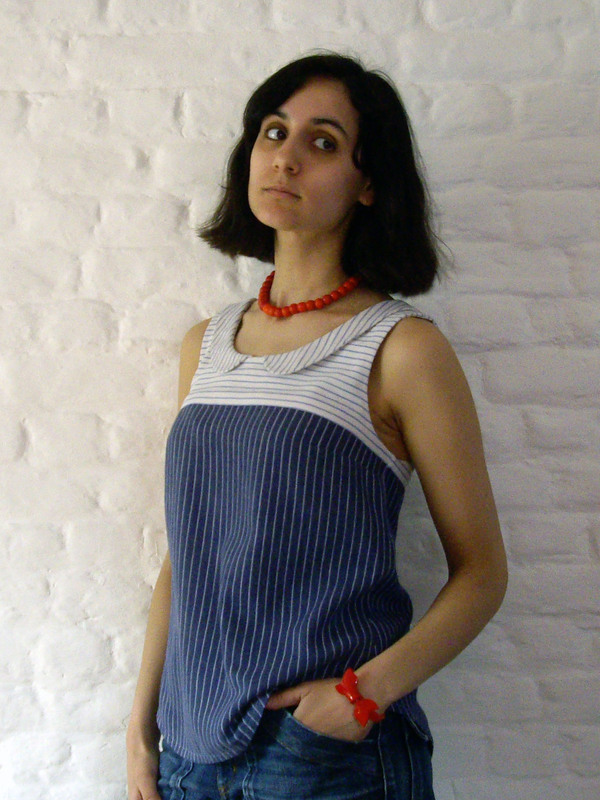 This is such a pretty top, love the way you co-ordinated the colours and stripes. Adorable top. I’ve been looking for a pattern like this for awhile now and was considering drafting it myself but this is so much better – saves time and frustration! Lovely and looks so carefully made but what’s really striking is how fresh it looks though the fabric’s on its third life! Thanks! I was lucky to be able to avoid the most damaged spots of the shirts when cutting the pieces. ok! thats it. im getting a datura patteren. youve inspired me! Oooh, I’m glad to have inspired you! 🙂 It’s a really nice pattern to use up very small yardages. Thanks deer and doe for this nice travel in your blog. Nice datura ! Fabulous! In fact, going to get a pattern now! Thanks, I hope you’ll enjoy sewing it as much as I did! There’s a really neat tutorial (not made especially for the Datura) on the net for that part, the only problem is it is in French… But I think the pictures are pretty clear and could maybe complete the instructions of the Datura booklet? Here’s the tutorial, the outer fabric is the light blue one and the lining is the white one. Don’t hesitate if you have any more questions or if you need me to translate some parts of the tutorial for you! I love this little blouse, and that the collar dose not meet. It is perfect. Thanks for sharing! Excellent collar. Buttons make it an original. Excellent.